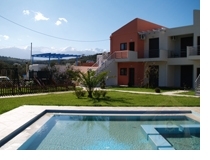 Theo’s House offers brand new beautifully finished accommodation only a stone’s throw from Almyrida’s pretty sandy beaches and excellent tavernas. The apartment enjoys peace and quiet in lovely countrified surroundings with views to olive groves, the village, tree clad hills and The White Mountains. To the front of the property there is a common area with a generous 80m2 swimming pool (including 2 separate shallow areas that are perfect for children or less confident swimmers), a built-in barbeque, a grassy lawn, a picnic bench and a children’s play area which includes 2 swings, a see-saw, and 2 slides. The well kept lawn and the playground are ideal for keeping the younger members of the family entertained whilst their parents keep a watchful eye on them when relaxing on the sun-loungers beside the pool.